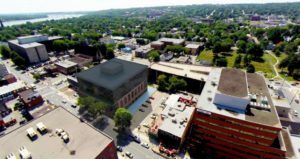 FREDERICTON — Commercial Properties announced today plans to develop a Class A 92,000 square foot development on land it owns on the corner of King and Regent streets in Fredericton. The project is still in the planning phases, and no date has been set for construction to begin. The proposed six-story building will take up only a portion of the available land, making additional development possible. “This is a very strategic location and we would like to leave room open for other future projects,” said Moore. Saint John architects Murdoch and Boyd have been tapped to design the new building. They are planning a design blending traditional and contemporary elements including a brick façade on the lower floors transitioning to glass on the upper floors. Commercial Properties has 1,000,000 square feet under management, including such landmarks as Brunswick House and Centerbeam Place in Saint John and Commerce Place in Moncton. The company is known for its environmental stewardship, with several of its largest properties achieving Gold status in Leadership in Energy and Environmental Design (LEED) or BOMA Best certification. Potential tenants of this proposed development are invited to contact Commercial Properties for more information.